After sitting at your desk all day, your feet might fall asleep. While lack of circulation is the most obvious reason your toes tingle, if you weren't doing anything to cause this sensation, it may originate from hidden reasons. Did you know that excessive alcohol and tobacco use can cause nerve damage, which may lead to numbness in your ligaments? Although it is not a highly common outcome, it is a possibility. Read on to find out other hidden reasons your extremities tingle. During this midlife transition for women, hormone levels will fluctuate. Because estrogen, one of the main female hormones, has an effect on the central nervous system, it is possible you may experience tingling extremities. They are a common occurrence, and not usually something to be alarmed about. Diabetic patients commonly experience painful tingling, otherwise known as diabetic neuropathy. In these cases, the pain can be disabling. However, your doctor can offer ways to keep your blood sugar levels under control. 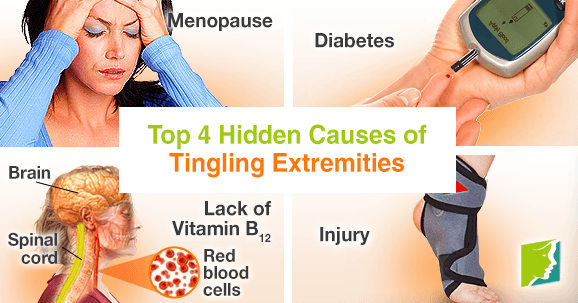 A deficiency of B12 vitamin (cobalamine) can cause your extremities to tingle. Some vitamins are absolutely necessary for your nerves to function properly. If you are lacking B12, this could lead to pernicious anemia, a condition where the body does not possess enough healthy red blood cells. Because red blood cells provide oxygen to the body, a lack of them will mean parts of your body don't have optimal blood flow, thus leading to numbness and tingling. When the body suffers trauma, nerves can be compressed or damaged and result in nerve pain. Tingling extremities are most common in injuries where a bone becomes dislocated or a disc herniates. It is crucial to seek medical attention if you are suffering post-injury nerve pain, as the damage could become permanent if left untreated. While there is no cure for tingling extremities, you can make changes to your lifestyle to ease the discomfort. Regular exercise is the easiest and most beneficial way to reduce tingling by allowing oxygen to flow through your blood. Grab a friend and go for a hike! If you sit at a desk all day, take frequent breaks and get your body moving. Taking a class at the gym or even just a long walk on your lunch break can help tremendously. Exercise helps to reduce anxiety and stress as well. Herbal remedies paired with lifestyle changes are generally seen as the best route for suppressing tingling in extremities that can result from aging. Coming up with a routine and a plan to tackle the issue without medication is your best bet, and will save you from any potential side effects. Tingling skin can be a worrying and irritating symptom. Its most common cause is anxiety. Learn why here.